"And the temple of God was opened in heaven, and there was seen in his temple the ark of his testament; and there were lightnings, and voices, and thunderings, and an earthquake, and great hail." 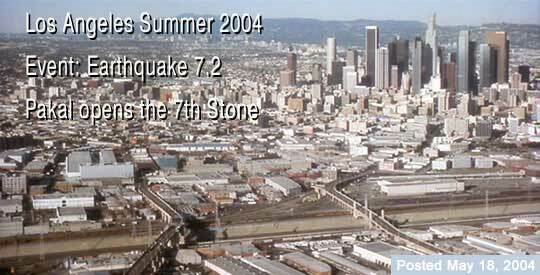 09/28/04 - PARKFIELD, Calif. - A strong earthquake struck Central California on Tuesday, and it was felt from San Francisco to the Los Angeles area, according to the U.S. Geological Survey. There was no immediate report of injuries. The quake, which struck at 10:15 a.m. PDT, had a preliminary magnitude of 6.0 and was centered 9 miles south of Parkfield. The area is 17 miles northeast of Paso Robles, scene of an earthquake that killed two people in December 2003. A series of aftershocks quickly rattled the area, one with a preliminary 5.0 magnitude four minutes after the main earthquake and three others 4.1 or above. The quake was felt along a 350-mile stretch, as far north as San Francisco and as far south as Santa Ana, southeast of Los Angeles, the geological survey said. Notes from the Editor: Although we anticipated a 7.2 in the mathematical algorithm of September 2004, the quake fulfills the opening of the 7th Stone and ark according to the Mayan Prophecy. However, there are 2 more days left in the month in the Toutatis Code. "We've entered in a new violent period of seismic and volcanic activities in the world for the next 8 years. Our thin crust is too unstable to hold what we can't understand yet to come. You can ignore it or live with the Gods of Xibalba forever I'm only a witness.."